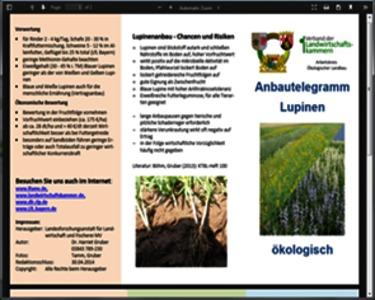 This brief and practical information leaflet for blue, yellow and white lupins serves a farmer to get introduced to its cultivation. Aim is to promote the cultivation of lupins due to its beneficial effects as precrop, as it fixes nitrogen, makes phosphorus available and is high in proteins. 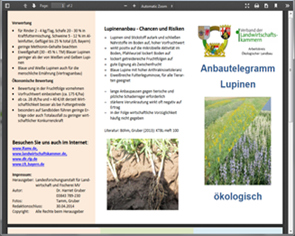 This leaflet describes soil properties, water supply and weed pressure conditions for a successful cultivation of each lupin species. Furthermore recommendations in variety choice, crop rotation, mixed cropping are given i.e. soil tillage, vaccination, sowing, fertilization, mechanization and weed control by hoeing and harrowing, harvesting, processing (for animal feed and human food), economic assessment. As conclusion the most important pros and cons of lupin production is listed. This tools gives basic information and benchmarks on lupin production for newcoming farmers. Poor soils due to nitrogen and phosphorus-deficiencies. Need for alternative protein sources. Lupin cultivation has a high preceding crop effect as it fixes nitrogen, is tolerant to poor soils and high in protein which is used as green manure and stock feed.